Yes, I am a movie and series junky! But if I have to choose just one movie, it would be Scott Pilgrim vs. the World! I’ve seen it dozen of times, but it just doesn’t get boring… And the comics books it’s based on are even more awesome and filled with much more details. For my little speed-craft project I’ve taken a detail from the Scott Pilgrim universe. Ramona is able to travel via subspace highways (and right now I wish my Amazon package could do that too), and sometimes those subspace highways go right through Scotts dreams. The comics books explain the theorie of subspace much more, but even in the movie you get some hints (you see Scott and Ramona using such a door on their first date). All entries to the subspace, like Ramonas bag or those doors, are marked with a five pointed star. And I really need one of these! 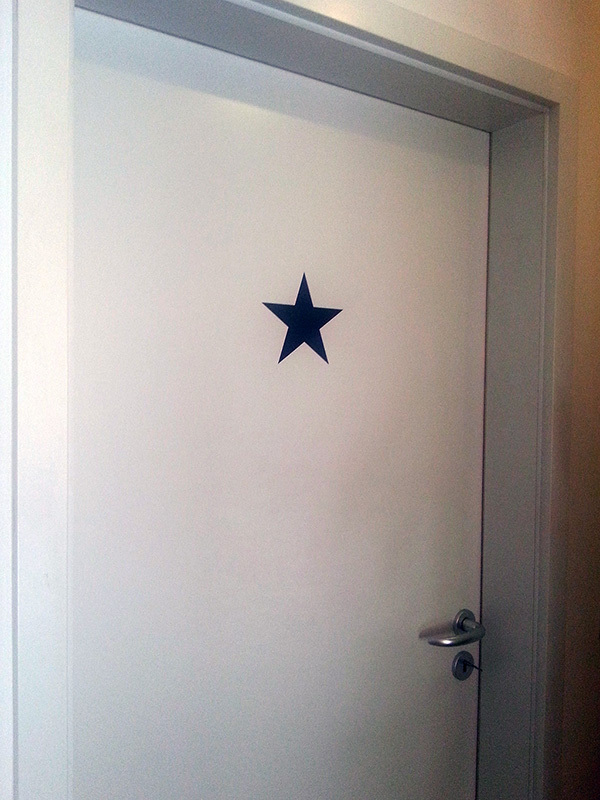 I’ve decided to put a black star on one of our boring white apartement doors, just like in the movie. All you need is black adhesive foil (let’s go to the craft store!). Take care that it can be removed without leaving any residue, landlords can be a bit sensitive with such things. Then you have two options: You can either construct a five-pointed star yourself with a ruler and a compass OR you print out a stencil (most software, like Word, have star shaped objects). Our star has a diameter of 16cm, it depends on the size of your door. Cut it out, put it on the door, finshed! Now you have your very own subspace highway door!